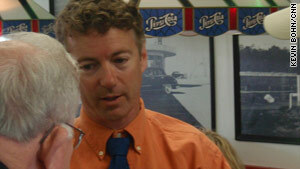 First-time politician Rand Paul is up against Trey Grayson, the Kentucky secretary of state, for a U.S. Senate seat. Incumbents are put to the test today with big primaries in key states. How will they fare on this anything-goes political playing field? For a full analysis, tune in to "John King USA," tonight at 7 ET on CNN. Party's on: Will the Tea Party take a leap forward in Kentucky? Its choice, anti-big government Rand Paul, is expected to win the Republican Senate primary in the conservative state against a hand-picked establishment candidate. The Obama effect: Sen. Arlen Specter has the president's support but could go down in his bid to keep his Pennsylvania Senate seat. That would further raise questions about how much Obama's muscle will help Democrats get elected in November. Stoking anger: Voters get more examples of what's wrong with Washington as one congressman steps down after admitting that he "sinned against God" with a staff member and another faces allegations of exaggerating his military record. Will it send Americans into the voting booth angrier? Arkansas: Will incumbent Sen. Blanche Lincoln overcome liberal and labor support for her insurgent challenger, or will the race be prolonged into a runoff? Although she's not expected to lose, how wounded will Lincoln be in the fall when she'll be a Republican target? Winds blow differently in Oregon: Incumbent Democrat Ron Wyden is expected to easily win Senate primary today and another term in the fall, complicating the national picture.